The first phase requires a strategy that will put you in a place which maximizes everything you earn in your working years to prepare for retirement as well as your legacy. The focus during this phase is growth. 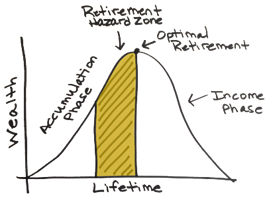 This phase requires a much different strategy from the Accumulation Phase because your time horizon to retirement is much shorter and thus you must protect your nest egg while still achieving growth for the future. We find the biggest mistakes folks make with their financial decisions are in this stage, and typically the biggest mistake is inaction. The third phase is where you are no longer earning but actually living off what you have saved. This phase requires a completely different strategy than the previous two in order to make sure your wealth lasts as long as you do.